Welcome to Author Thursday hosted by Never Too Old for YA and NA Books group on Goodreads. 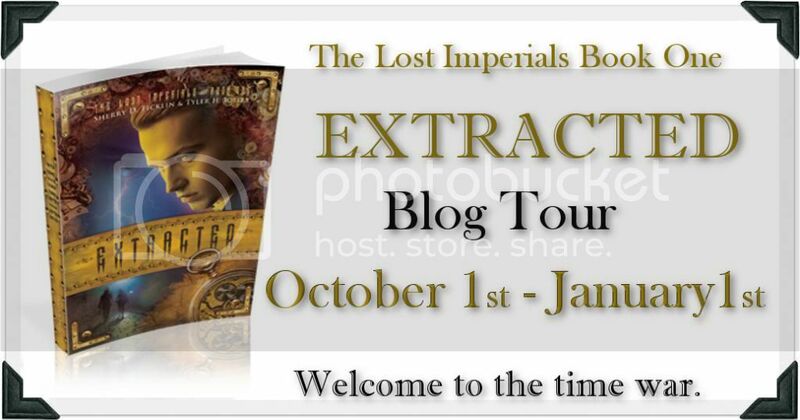 Today we welcome the most awesome Sherry D. Ficklin and Tyler Hall Jolley, authors of Extracted (The Lost Imperials #1). So, without further ado, let's hear what my friends have to say! Tyler – Short answer no. Long answer, I fell in love with writing in my early 20’s but I felt that there was too much risk involved with a career move to just be a writer. My dad encouraged me to find a profession that I loved, he was a dentist so it becoming an orthodontist and periodonist was an easy choice. Now I am able to have a career I love and also explore my new career in writing. Sherry – Yeah, I’ve always loved writing. It is in my blood, I think. The idea of doing anything else makes me irrationally upset. Tyler – My first book, Neto Lexan and the Impox Secret, took me about a year to write because I was in dental school, but didn’t hit the shelves for 8 years. To get the rough draft done on Extracted took three months. But from first draft to actual publication on the shelves took about 2 years. Sherry - 2-3 months depending on my schedule at the time. Tyler – Plot ideas pop into my mind each and every day. For me it doesn’t take much effort to come up with a pretty cool theme for a book. Ideas come to me constantly, like while I’m working on patients or at baseball games, or driving. Some may call it ADD I call it creative imagery. Sherry – Yeah, it’s the same for me. Ideas just hit me. Usually when it’s least expected or convenient. Like in the shower. Tyler – No, just whenever I have downtime. I carry small notebooks with me so I can jot down a quick note if a scene pops into my mind. When I find time to write I do, it’s not a very structured schedule. Sherry- I do. I write while my kids are at school, so it’s a pretty regular schedule. 9-3 Monday-Friday. Though Wednesdays are my days to catch up on blog/website stuff. Tyler – I have a wonderful wife, she creates time for me when I’m close to deadlines. We have four kids, two dogs and a bunch of chickens, quail and pigeons; to say she’s my rock is an understatement. Sherry – Very carefully. I try to keep my family as my number one priority. But they also are really good about respecting that this is my job, so…they are wonderful. Tyler – If you can create a world in that is interesting then the story line becomes even more elaborate and fun. I also think having characters that are well developed and unique can make or break a story line. I’m also not a fan of “insta-love”…but that could be because I’m a guy. Sherry – I need characters I can relate to and root for. I can forgive a lot of other things in a book when I’m really connected to a character. Tyler – Edits. We have wonderful editors, but edits were the hardest for me. Sherry and I felt like Frodo and Sam after their trek to Mordor after our first major round of edits. Tyler – I’ve written and published two. Neto Lexan and the Impox Secret is my first and it will always by my ‘baby.’ It helped me get through the stresses of dental school. 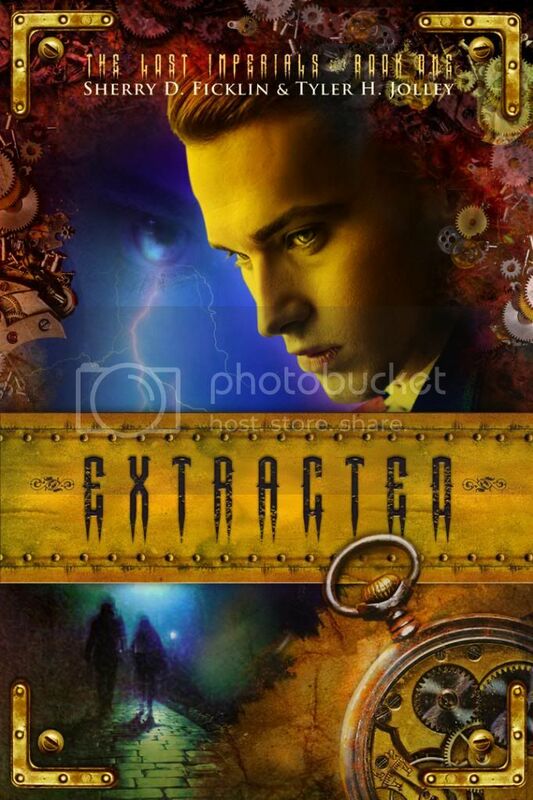 With Extracted it has helped me become a better writer because we used different points of view and the steampunk genre is fun to write. Sherry – For me, whatever I’m writing at the time has to be my favorite. I fall madly in love with my characters and stories. I have to. I need that to carry me through to the end. Tyler – Lex, from Extracted, is my favorite. He’s the complete opposite of me, almost like an alter ego. Lol. Sherry- Oh, I don’t know. That’s tough. I think probably (from EXTRACTED) Sisson. She has a lot going on under the surface. I can’t wait to really write her. Tyler – Everywhere. On a boat, on a train, in my office, in the rain, my Mac is well worn. It travels with me to each of my offices and I write in between patients. When I’m not writing at work, I utilize any downtime I have. Sherry- My office mostly. It’s my nerd haven. But at McD’s or Starbucks when the noise levels get too high. Tyler – I thought writing a book was the hard part. Wrong. I had no idea where to start so I actually bought the book, “Getting Your Book Published For Dummies.” It sent me in the right direction. Sherry- With my first book, I just sort of went for it. I called up publishers like, hey, you wanna read my book? I’m not sure if it was luck or just idiocy that got my first series published. With Extracted, it was more like a lucky break. Tyler – Dude, they love them. They’re my family, they have to. In all seriousness, my goal with my books is to make them something my kids can read and be proud of. Sherry – It was cool to my kids at first, but not they are totally unimpressed by me. The only thing they really enjoy is getting to meet other authors. I am, however, chopped liver. Tyler – I love to bird hunt, fish, mountain bike, farm, and one day I’d like to enter a lemon Tasty Kake pie-eating contest. Sherry- reading, movies, anything even remotely nerdy. Here’s where I get random, fishing, classic muscle cars, board games, and painting. Tyler – Three pieces of advice: 1) Keep with it, read a lot and make sure you never compromise your values to sell books. 2) If you persevere luck will find you. 3) The hardest part is to get the book from start to finish on paper. Sherry- And have a great co-author who does all the heavy lifitng. Lol. Tyler – One of my favorite authors is Michael Crichton, of his books arTimeline, Jurassic Park, and Micro are favorites. I also like Dan Brown. Sherry- No favorite author or book really, it sort of varies depending on my mood. I liked Clive Barker’s The Great and Secret Show. It was dark and menacing and also a beautifully built world. It made me want to be able to do that. Tyler – I bounce a lot of ideas off my brother, Keaton. With Extracted I relied on the awesome team at Spencer Hill Press. Sherry has been awesome, to have a co-author who I can verbalize a story to and have them listen and not think you’re crazy or lose interest is helpful. Sherry- I have a writers group I go to as well as some great beta readers. But with Extracted it was Tyler and the editors. Tyler – Always, I have ideas floating through my head constantly. It’s just a matter of getting them on paper. I’m currently co-writing (with Sherry, of course) the second book in The Lost Imperials series and my assistant is bugging me about getting Neto 2 done. My agent John Rudulph at Dystel & Goderich Literary Management has me writing a new YA, sci-fi, dystopian book called Chemika. Sherry- I’m always writing. Right now it’s something a little new and scary. A ghost story with a twist. We just finished up Prodigal and will probably be starting edits on that soon. Thanks so much for stopping by! It's always great to hear from you both and read about what you're doing! Sherry D. Ficklin is a full-time writer and internet radio show host with more mouth then good sense. She has a serious book addiction, but continually refuses treatment, much to her husband’s chagrin. Tyler and Sherry met one fateful day and bonded over their love for books, science fiction, and donuts. Their first co-written novel came shortly after. Now, they still do all those other things, but also go to various steampunk conventions and events under the guise of ‘research’. They can often be found lurking on the Lost Imperials Facebook page or over on the official website, www.thelostimperials.com. That's awesome! I hope you like it! Brooke, I can't thank you enough for your support. You are so awesome!